In 2009, the Government of Indonesia committed to a 26% greenhouse gas reduction by 2020 from ‘business as usual’ baseline levels, and to 41% with international support. 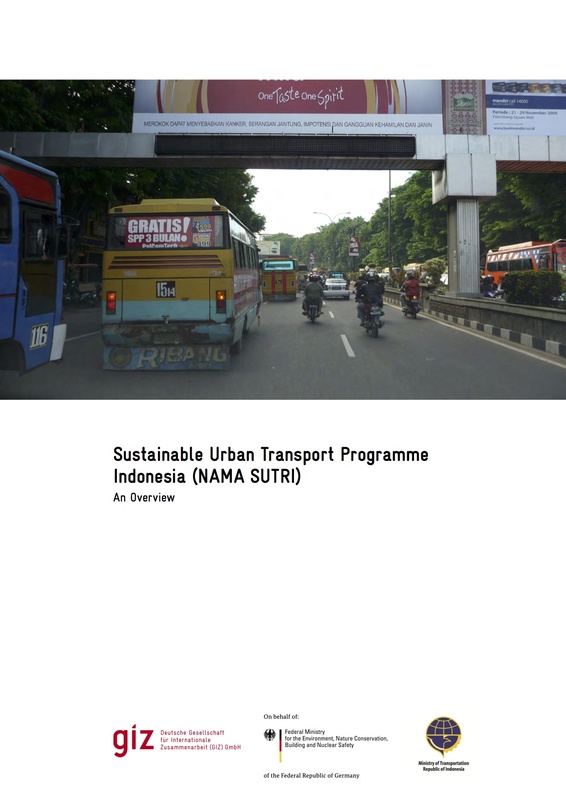 The Sustainable Urban Transport Programme Indonesia (SUTRI NAMA) has been registered with the UNFCCC in 2012. It was selected by the British-German NAMA Facility to receive technical and financial support for the implementation of the pilot phase in a so-called through a so-called NAMA Support Project. Transport is the third largest source of energy-related CO2 emissions in Indonesia. Due to strong urbanisation and motorisation trends, transport has become a significant challenge for cities in Indonesia. Its car-oriented development is exacerbating air pollution, creating massive congestion and decreasing the quality of life. However, most cities lack capacity, policy guidance and access to sufficient financial resources to develop sustainable urban transport systems. The SUTRI NAMA was developed by the Indonesian Ministry of Transport with technical assistance from GIZ on behalf of the BMUB, in the context of the TRANSfer project. It build up on Indonesia’s Climate Change Action Plan (RAN-GRK). 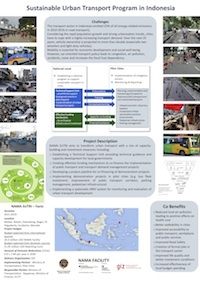 Cities in Indonesia contribute to climate change mitigation through sustainable transport policies and infrastructure projects supported by a national urban transport programme. This includes the establishment of a national subsidy scheme for cities and transport operators, which promotes the investment in sustainable urban transport infrastructure. 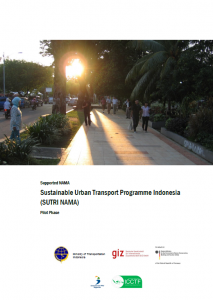 The SUTRI NAMA aims to transform urban transport in Indonesia with a mix of capacity-building and investment measures provided through a national urban transport programme. This includes (1) the establishment of a Technical Support Unit that will provide technical guidance and capacity development for local governments, and (2) the development of an effective funding mechanism to co-finance the implementation of public transport and transport demand management projects. In seven pilot cities, the NSP will develop (3) a project pipeline of eligible demonstration projects and co-finance (4) the implementation of demonstration projects in up to five cities (e.g. bus fleet investment, improvement of public transport corridors, parking management and pedestrian programmes). In order to monitor and increase transparency of the achieved impacts, the NSP will establish (5) an MRV system that initiates systematic monitoring of urban transport development which is urgently needed for effective decision-making. In this way, the NSP will pave the way for a transformational change in urban transport policy in Indonesia by creating effective ways for public and private investment in urban transport infrastructure and rolling stock, and by demonstrating good practice that can be upscaled to further cities in Indonesia. The NSP creates various co-benefits, including equitable access, reducing air pollution and improving the quality of life. The mitigation impact will be achieved through demonstration projects that encourage passengers to shift from private cars and motorcycles to buses and non-motorised transport and improve the energy efficiency of public transport systems. Further mitigation impacts can be expected though upscaling beyond the pilot cities.